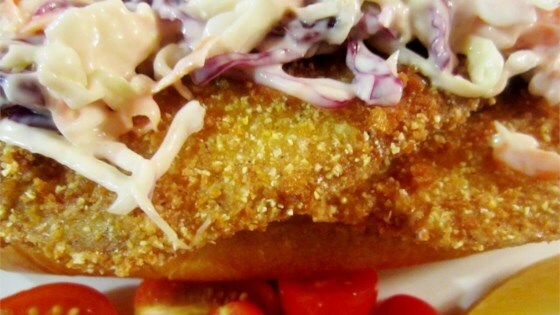 "Crispy fried catfish is piled into hoagie rolls and topped with tangy coleslaw for this authentic Po Boy sandwich." Combine coleslaw mix, pepperoncini peppers, red onion, mayonnaise, lemon juice, red wine vinegar, Dijon mustard, sugar, salt, 1/2 teaspoon granulated garlic, 1/2 teaspoon granulated onion, and lemon pepper in a large bowl. Toss until well combined. Cover and refrigerate until ready to use. Place catfish fillets in a large shallow baking dish. Sprinkle hot sauce over the top and turn the fillets to coat. Combine Cajun seasoning, flour, cornmeal, bread crumbs, 1 tablespoon granulated garlic, 1 tablespoon granulated onion, black pepper, and cayenne pepper in a large brown paper bag. Add catfish fillets and shake gently to coat fillets thoroughly. Heat olive oil in a large skillet over medium-high heat. Fry breaded catfish fillets until browned and crisp, about 3 minutes per side. Place on paper towel-lined paper plates to drain. Spread each hoagie bun with 1/4 cup remoulade-style spread. Place 2 catfish fillets on top and top with 1 to 2 cups coleslaw. Garnish with lemon wedge, cherry tomato halves, and banana pepper rings. Here's the recipe for Remoulade-Style Sandwich Spread. Perfect just as it is! I would actually prefer this without the bread, or maybe a burger size. Awesome!!! I don't eat cole slaw and this was good. My whole family liked it. I will make again.